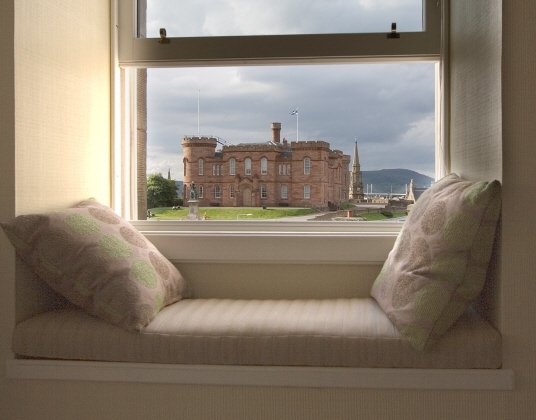 Set high above the River Ness, Dunvegan-Inverness self catering is a recently-renovated Victorian stone villa in the centre of Inverness, looking out to the Castle. The city centre is compact, so nowhere is more than 5 minutes’ walk away. 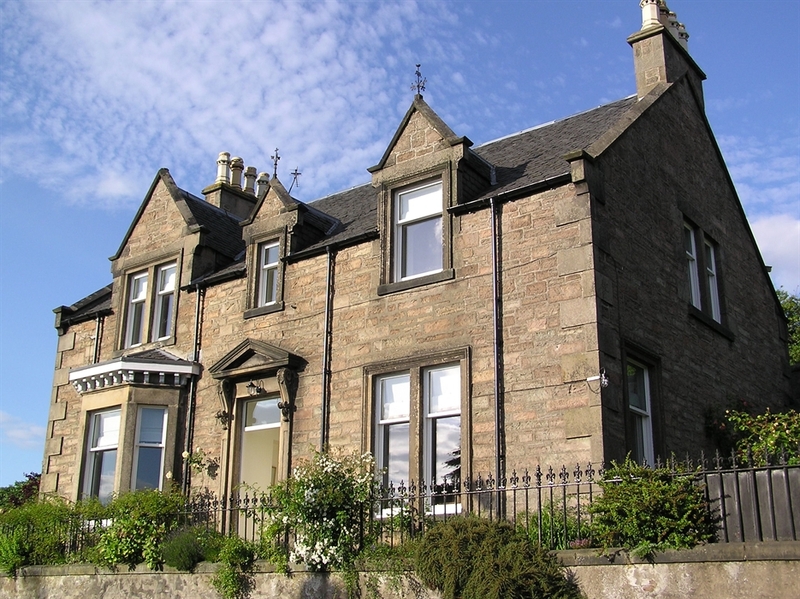 Set high above the River Ness, Dunvegan-Inverness self catering is a recently-renovated Victorian stone villa in the centre of Inverness. The city centre is compact, so nowhere can be more than 5 minutes’ walk away. 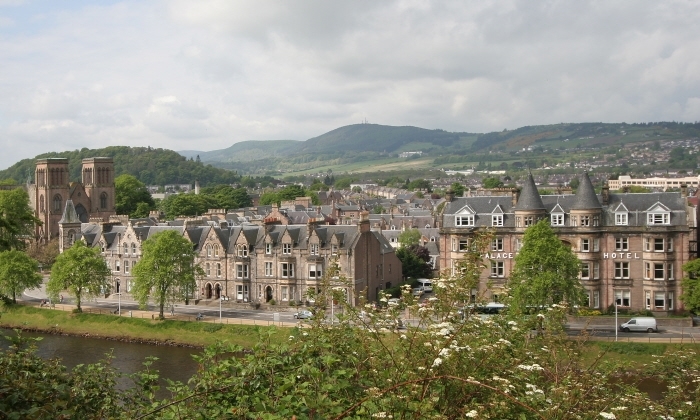 Inverness Castle is almost on our doorstep! The Tourist Information Office and High Street shopping are just a few minutes from our front door. You can walk down the hill to the riverside, head along the bank to the Ness Islands, cross the river by the footbridges and walk back – - not knowing you’re in the city! There are many welcoming cafes, busy pubs and cosmopolitan restaurants to tempt you – - all within easy reach. You won’t need to take the car! 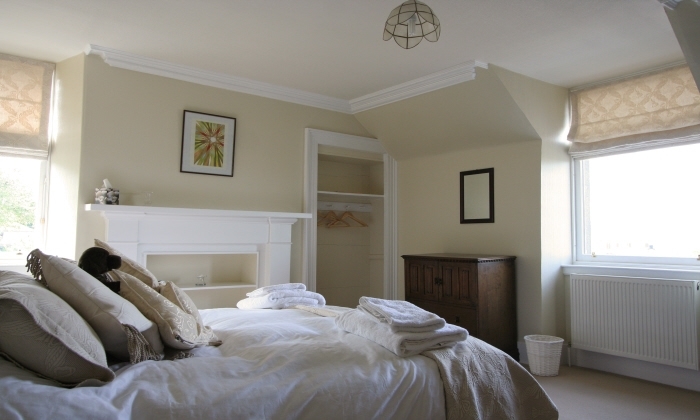 • Dunvegan sleeps 6 in 3 bedrooms. Additionally, there is a double sofa bed available downstairs for occasional use. • Access to the property is via steps from the pavement level – - Please ask if you need more information. • A visitor’s parking permit is available during the day. • Dunvegan is a no smoking and pet-free area. 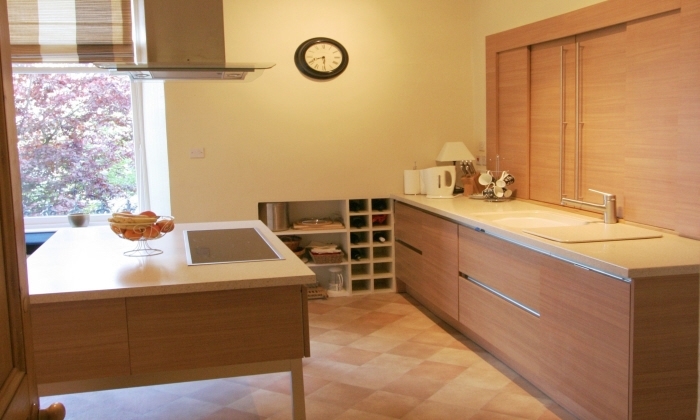 There is a very well-equipped, modern kitchen in Dunvegan, so when you want to enjoy making food in a convivial atmosphere, the choice is open to you. Have dinner in the spacious, airy dining room, relax afterwards in the comfort of the lounge, or curl up with a good book in the study. We are happy to provide a basic ‘welcome pack’ when you arrive – - some morning rolls, milk, eggs, bacon, margarine, marmalade, tea and coffee. If you or one of your party have special dietary requirements, please let us know at the time of booking and we shall do our best to accommodate your needs. The lounge and study both have TV sets with Freeview and DVD players. There are plenty of board games, jigsaws and books in the study. Don’t worry if you haven’t finished reading that novel – - take it home with you! All we ask is that you buy another from one of the charity shops in town and leave it here to replenish our stock. 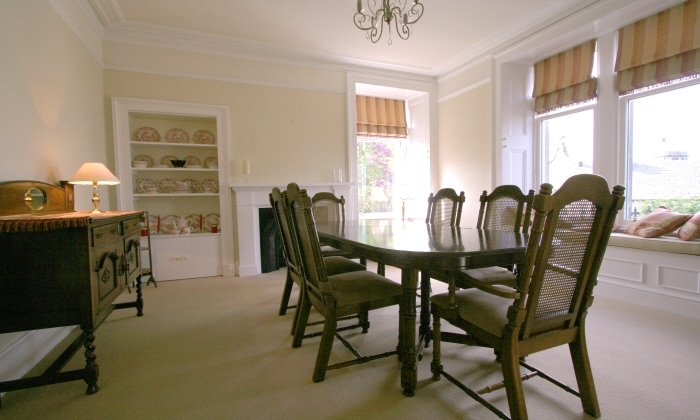 The dining room is ideal for lively conversation over a relaxed, informal dinner – - as well as for studying the map and planning your next day’s outing. See the Out and About page for inspiration and ideas if you haven’t been in this area before, or take a look at the various brochures for local tourist attractions. With the brochures, there is a notebook. Please write down your impressions of places you have been and things you have done – - both positive and negative – - so that others can benefit from your experiences and find the best outings, visitor attractions, restaurants, bars and cafes. Adjacent to the study, the utility area will take your coats and boots – - and it also has a freezer, a washer-dryer and ironing facilities. There is a compact WC below the stairs. Upstairs has the best views! Look out the front windows over the river towards St Andrew’s Cathedral and the Eden Court Theatre towards Tomnahurich, Craig Phadrig and Craig Dunain; to your left, below you the River Ness tumbles down from the Great Glen and Loch Ness; to your right you have an excellent view of Inverness Castle, down the River Ness with its charming Victorian suspension bridge, across to the Black Isle and to Ben Wyvis beyond. 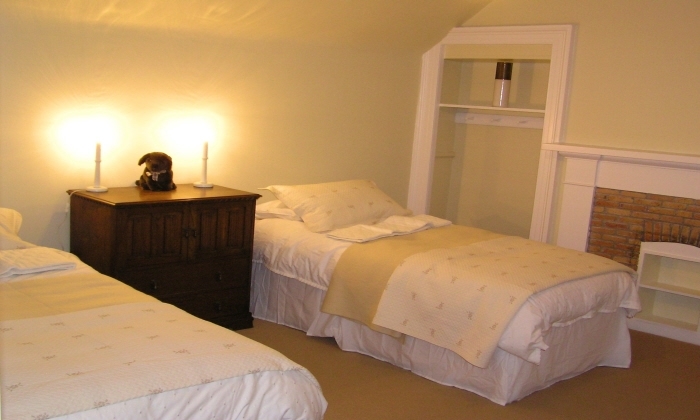 Dunvegan sleeps 6 adults in 3 bedrooms. For infants, there are cots available on request. 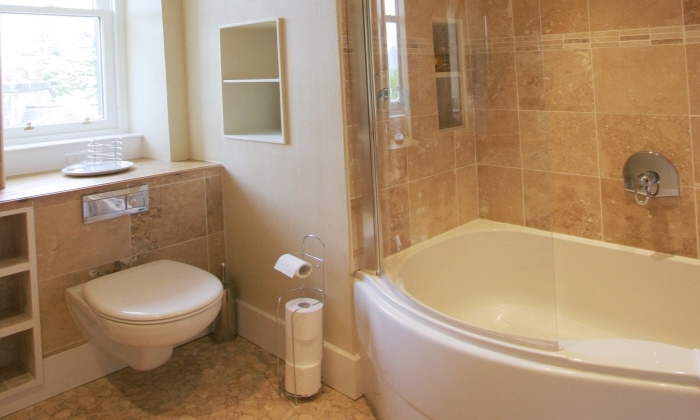 There is a large double bedroom and a large twin bedroom, both of which share an ample bathroom. Downstairs, there is also a double sofa bed in the study. If you book within 28 days of the date of your intended arrival, we offer a 5% discount against the full price of your stay. If you book within 14 days of the date of your intended arrival, we offer a 10% discount against the full price of your stay. This applies equally to Flexible Breaks as it does to Full Weeks.